We get it, it’s cold in Fargo. Don’t let that stop you from visiting though, because we promise Fargo has plenty to love, even in the winter months. Need proof? Fargo was recently voted the 4th happiest place in the nation, (last year we were 5th happiest) and our sister city, Moorhead, was voted the 3rd happiest! Expedia also ranked us in their list of the 17 most beautiful winter wonderlands. 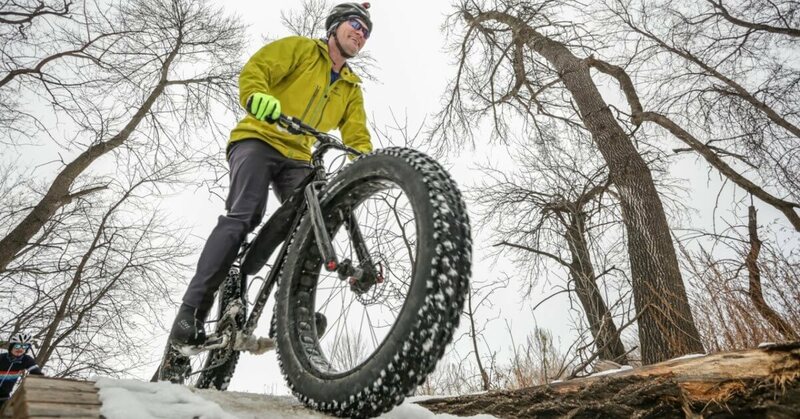 Explore the wintry trails from the saddle on a fat tire bike. These specialized mountain bikes are built to accommodate the soft snow. Even though it may sound intimidating, it’s as easy as riding a bike (sorry, we had to). Head to M.B. Johnson, Gooseberry, or Iwen Park for the best-groomed trails around. You will need to bring your own bike or you can buy a gently used one from Paramount Sports or Great Northern Bicycle Co.
Fargo’s notoriously flat, but you can still find a few great sledding hills (and the walks back to the top aren’t too tough). Bundle up the kids and head to Mickelson Park in Fargo for free sled rentals. Take a relaxing walk through the snowy trails on snowshoes. This is an activity that all ages and agility levels can enjoy and a great way to get off the beaten trail and explore. There are two rental facilities in Fargo-Moorhead: Edgewood Golf Course, and M.B. Johnson Park. Because of the wide-open prairies, the Red River Valley has beautiful frosty sunsets and sunrises. Get out on the back roads, head to one of our many parks or even go Downtown to capture your own version of the perfect sunset photo! When the temperatures drop the lowest, the sundogs come out. Brave the cold during these below zero temperatures to get an enviable Instagram photo like this one from Junkyard Brewing. Take a selfie with one of the several murals scattered throughout Downtown Fargo and Moorhead or with the Iconic Fargo Theatre marquee. Pro tip: Use the warm and free Link FM bus to get around. Fargo and its sister cities West Fargo and Moorhead have 32+ outdoor ice skating rinks between them. If you don’t have skates with you on this trip, hop on with your boots and play a fun game of broomball. With Fargo being so close to Canada, we, of course, have our own curling club. The FM Curling Club features world-class curling events including the USA Curling Nationals. Catch an exhilarating Fargo Force Game at the Scheels Arena. As part of the United States Hockey League, the Fargo Force help to produce many professional players. Attending a game is a great way to see the up-and-comers in the hockey community. Splash into the Hulbert Aquatic Center for open swim many times a week. They even offer inflatable swim events for the kids! Stay cozy at one of our local coffee shops or head over to our one-of-a-kind distillery or one of our eight breweries. Or, check out our events calendar to see what different local events are happening while you’re here. Mosey through our two free art museums, stand next to the full-size replica Hjemkomst Viking Ship, or imagine yourself flying in one of the many vintage planes at the Fargo Air Museum. Ask any Fargoan about the key to enjoying Fargo in the winter and they will say to dress for the cold. Fashion isn’t really a factor when it comes to negative temperatures, so don’t be afraid to bundle up! Also, keep in mind that although the winter may seem long, it will make your appreciation for warm spring days seem even better. Looking to spend two days in Fargo in winter? Check out this winter itinerary for Fargo to help jump start your planning.